Seunghwan Lee moves all in for 565,000, and Bart Guthrie calls in the big blind. The board runs out 8♦♦5♣2♥6♣A♦, eliminating Lee in 10th place. Action folds to Dan Bonin who moves all in for around 450,000, and Bart Guthrie reshoves over the top from the small blind. The big blind folds. "I am gonna need some help I think," Bonin says as he turns over 4♣4♠. The board runs out Q♣J♠3♣10♠10♦, awarding Guthrie the pot, and eliminating Bonin in 18th place. There were a total of 243 entries in today's $3000 No-Limit Hold'em Big Stack event, generating a prizepool of $61,285. The top 27 places will make the money, with first place taking home $14,648. The final 29 players are now heading out on a 60-minute dinner break. They will return to play Level 26, with 15,000/30,000 blinds, and a 5,000 ante. The chip leader heading into break appears to be Joe Chividian. Chividian took the lead after he won a monster pot, set over set, in the last level before break. Chividian sits with 2,700,000. 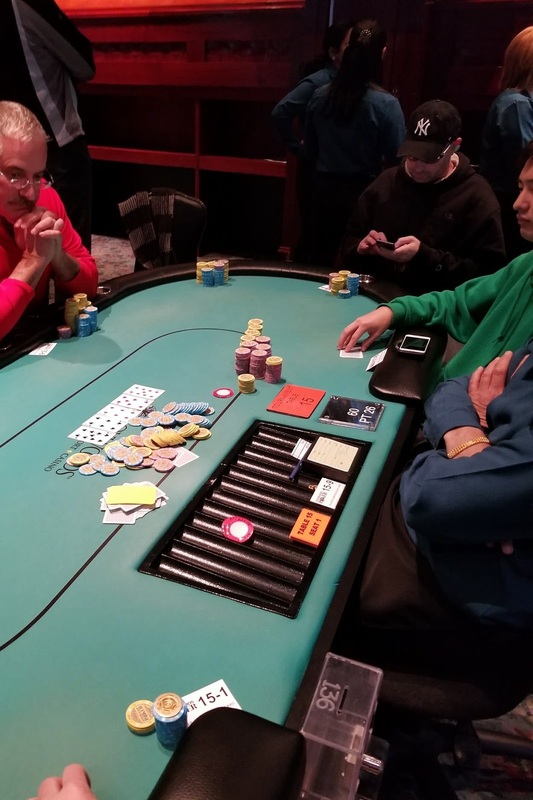 Facing a raise from Cao Yiming, Bob Riccuti moves all in for around ten big blinds, and Rob Garrett also moves all in in later position. Seunghwan Lee quickly calls in the big blind, and Yiming, the original raiser, folds. The board runs out 3♣3♦2♥9♦5♥ awarding Lee the pot, and eliminating both of his opponents from play. Action folds to Rob Garrett in the hijack who moves all in for around 220,000, and Seunghwan Lee moves all in for more on the button. All remaining players fold. The flop comes 9♦4♣3♣ leaving Lee in the lead with his pair of tens, but giving Garrett a gutshot straight draw. The 5♦ on the turn brings the straight. The river is the 2♦ and Garrett doubles up, while Lee makes a puke face jokingly. "That was a nice turn for me," Garrett responds to Lee's face-making, while slightly giggling. A player in early position limps in, and Leonard Loyd moves all in from middle position for around 55,000. The next player to act, Dan Fairweather also moves all in for 220,000. 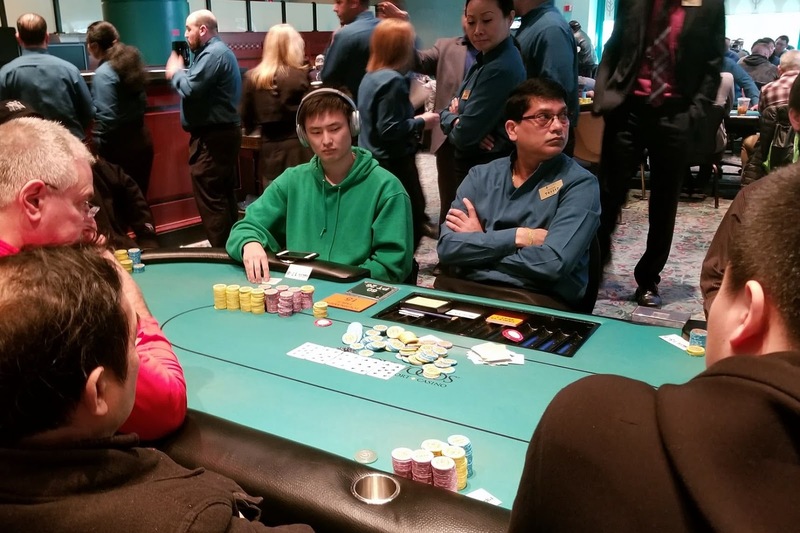 Joe Chividian is next to act, and he pauses for 30 seconds before also moving all in for 290,000. It folds to Cao Yiming in the big blind who says, "Please let me have aces here," before looking at his cards. After he looks Yiming goes into the tank for nearly a minute before hesitantly mucking his cards. "Good thing you mucked before you talked yourself into a call," a player at the table that's not involved in the hand says to Yiming. The board runs out 6♠3♦3♣Q♣8♦, awarding Chividian the pot, and eliminating his two opponents from play. After the hand is over, Yiming tells the table that he folded ace-king. There were a total of 1,212 entries over the course of the three starting flights of Event #1, with 146 (plus one double bag) advancing to Day 2. The prizepool totals $623,089, and the returning 146 players are all officially in the money and guaranteed at least $1,200. Due to the incoming snowstorm, both tournaments scheduled for March 13th have been cancelled. The board reads 9♠6♠6♦7♥9♦, and there is around 290,000 in the middle. Cao Yiming is deep in the tank, and Stephen Song is sitting motionless with 105,000 in chips sitting in front of him. Yiming thinks for nearly three minutes, as a crowd begins to gather around the table to watch the monster pot taking place. Yiming begins to shift back and forth in his chair, and apologizes to the table for taking so long. After nearly four full minutes have passed, Yiming tosses in a chip to call. Song shrugs his shoulders as he turns over 10♣10♥, and Yiming shows Q♥Q♦. "I put you on pocket tens," Yiming says to Song as Song stands up from the table and prepares for his payout. After Song has existed the tournament area Yiming says, "It was because he shoved the river." 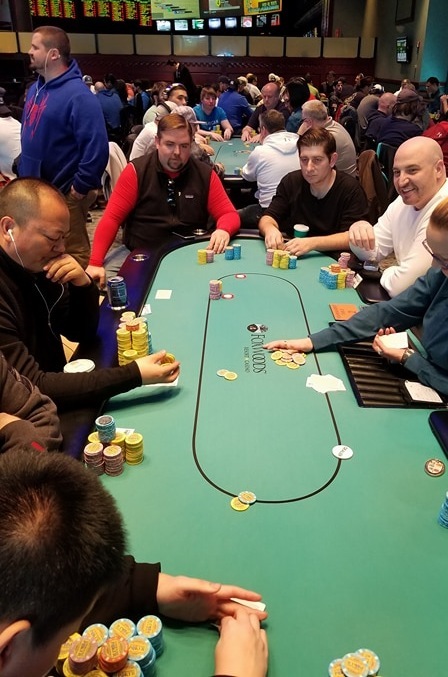 He then fills in the Foxwoodspoker.com blog staff on the action leading up to the flop. According to Yiming, Song had raised to 9,000 pre-flop in middle position, and Yiming re-raised to 21,000. Song called. Song then check-called a bet of 21,000 on the flop. On the turn, Song checked, Yiming bet 52,000, Song raised to 105,000, and Yiming called. On the river, Song open-shoved all in. After this pot, Yiming has taken the chip lead with over 600,000 in chips.